*We’ve partnered with Beech-Nut to help stop the cycle of mom-shaming. There are a lot of beautiful things that bond us as mothers. But there are also some not-so-beautiful things. Mom-shaming is one of them. Even if you've never heard the term, there’s a high probability you've felt some sort of mom-shame since you've become a parent. And there’s also a big chance you’ve done some mom-shaming yourself. We know what you’re thinking: “who me? I’d never do that!” But according to a recent Beech-Nut survey, 60 percent of moms actually admit to judging another mom. Whether it’s over breastfeeding or bottle-feeding, working or staying at home, babywearing, homeschooling or something else entirely, it can be easy to find fault with the way someone else is parenting -- especially when it’s different from the way you parent. Insecurity is likely at the root of why we, moms, shame each other: when we don't feel good about ourselves, we tend to be more critical of others; and when others criticize us, we internalize it even more deeply. The insecurities that spawn from motherhood can even drive us to criticize our children and partners, which can ultimately make us less happy, less effective parents. Unlike guilt, which can sometimes motivate positive changes, shame has literally no positive outcomes. So how do we stop the cycle of mom-shaming? There are a few things we can do, both on and offline, to make motherhood a slightly nicer club to belong to. 1. Know that there's more than one way to raise a kid. And that's okay. There are breastfeeding moms, bottle-feeding moms, moms of one, two, three, four and five, stepmoms, single moms, lesbian moms, silky moms, crunchy moms, PTA moms, angel moms, rainbow moms, WTF moms and so much more. It's all good. Seriously. Diversity in the motherhood experience is what makes it so beautiful. And when you embrace that (not tolerate, but really fall in love with all the different ways there are to be a family) you will realize how little those differences mean. And you may even learn something -- a strategy, a trick, a secret about parenting -- that you wouldn’t have thought of yourself. 2. Think before you type. Okay, this one's for you, keyboard warriors. I know, it's not your fault. You were minding your own business, and then your toddler filled your last good bra with oatmeal, and you just wanted to vent by posting a picture of it on Instagram. Then someone just had to let you know that oatmeal is loaded with all kinds of stuff that will reduce your kid’s IQ. So you had to respond. Stop. Realize that mom (annoying but probably well-meaning) is not perfect, and getting into a steel-cut death match is just going to make the internet an even scarier place. 3. Be nice to yourself. I can be a real jerk...to me. And I hear that from other moms too. If only people could hear our inner monologues: we say things to ourselves that we would never, ever say to anyone else. What if, instead of beating ourselves up, we treated ourselves like the goddess we really are? I know that when I'm well-rested, well-fed, and I've taken a little bit of time out for myself, I am far more patient and understanding of others. I'm not that way all the time, but I'm getting better at catching myself before I turn into an unwashed, hostile terror. 4. Practice being nice. The rules of karma say what goes around, comes around. You are the only person that you have complete control over. Mom-shaming has a devastating impact that ripples from family to family, mom to mom. Choose not to play that game. Try reaching out to a mom you admire and tell her that she's doing a great job. Invite her out to coffee. Ask her how she's doing and take the time to listen. No one gets me like my mom tribe, and I definitely wouldn't have made it work without them. 5. Assume everyone is doing their best. After all, aren't you? Most days in motherhood, I feel like I literally could not do one thing more than what I've done. Yet, I go to bed with an unfinished list, unhandled resentments, and unwashed dishes every night. Assume that everyone is trying just as hard as you are, and cut them the slack you'd like for yourself. Want to stop the mom-shaming? 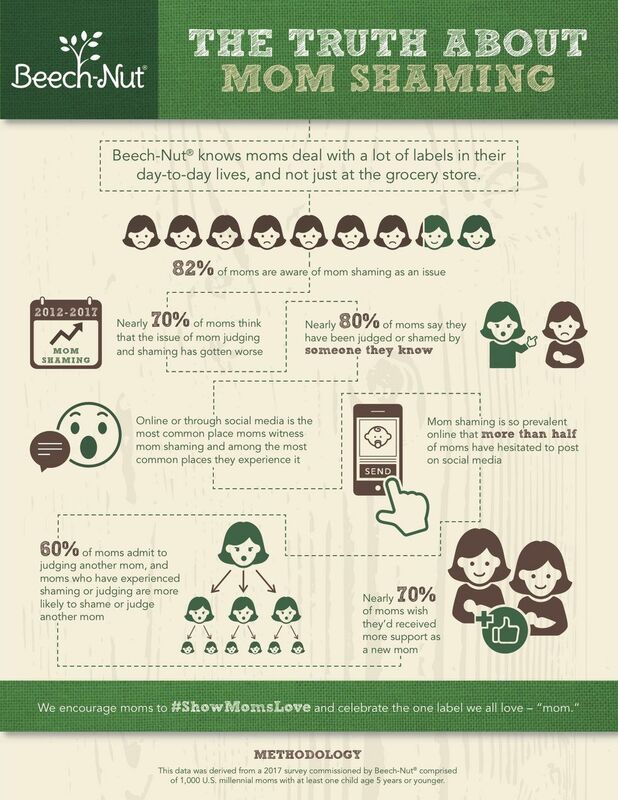 Beech-Nut challenges you to help turn the labels around by reaching out to tell another mom how great they’re doing by posting an image on Instagram with #ShowMomsLove. Photography by Justin Borucki for Well Rounded. Who said motherhood doesn't come with a manual? Subscribe to get inspiration and super helpful ideas to rock your #momlife. Motherhood looks amazing on you.